3D Cone Beam Imaging – Technology that captures 360-degree images of the teeth, jaw, and connective tissues. Apex Locators – Electronic devices capable of identifying the apex, or endpoint, of a tooth root. With an accuracy of more than 96 percent, this device makes it possible for an endodontist to administer root filling within 0.5mm of the apex. Ultrasonics – Advanced devices capable of aiding in retreatments that require the removal of metal instruments, such as posts, in the canal system. Ultrasonics can make it possible to identify calcified canals and assist in preserving the natural tooth. 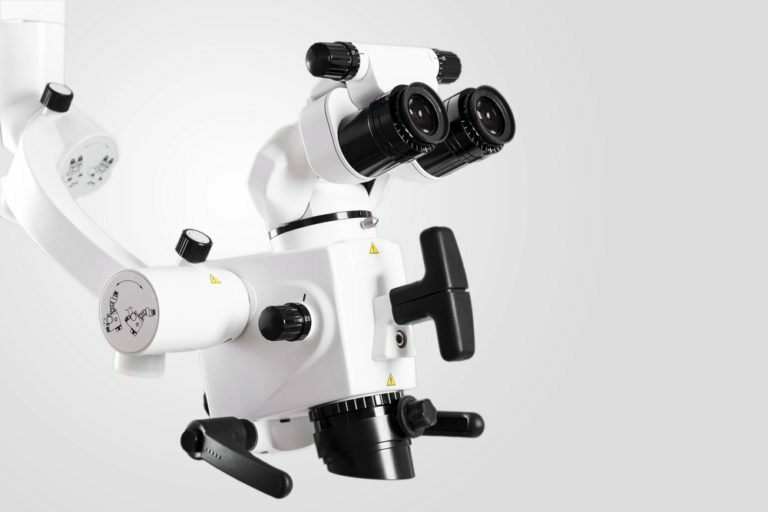 Surgical Microscopes – Surgical microscopes magnify the treatment site to allow endodontists to see into the tooth root system with greater detail. Surgical microscopes allow for increased precision when treating complicated root systems. Can I benefit from advanced endodontic technology? Yes! The technology available to endodontists is changing the way patients get care. Your treatment experience and outcome could be significantly improved by visiting an endodontist who employs the use of state of the art equipment. What should I expect from these types of technology? Depending on your procedure, you can expect a faster treatment and more accurate results. Will I need to visit my endodontist for a follow-up? Your endodontist will inform you of any post-operative instructions that you need to follow after treatment. Though you may not need to return to the endodontist following your procedure, it may be necessary for you to return to your restorative dentist if you need a crown or other restoration.